Environmentally-conscious and education-minded non-profit AShirtBag has embarked on its next major fund-raising effort. 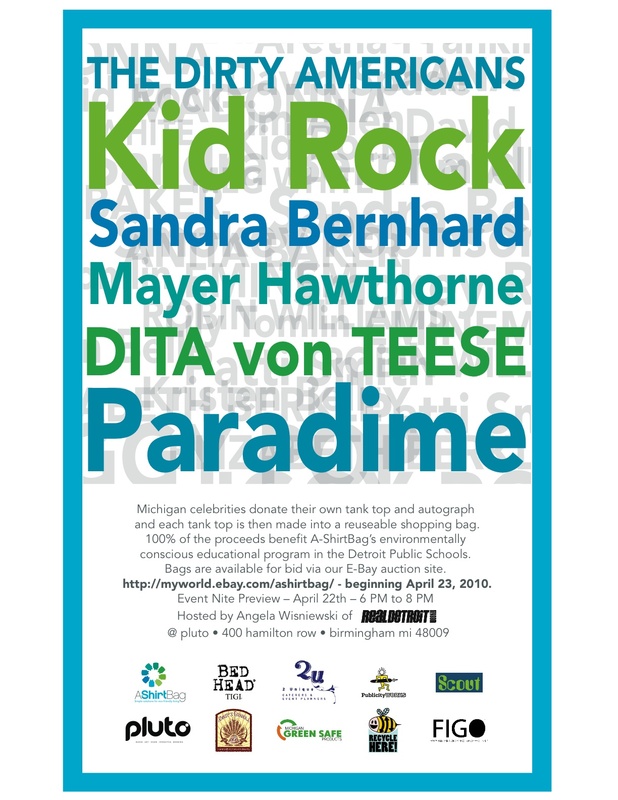 This time, founder Jeff Newsom adds Michigan born and bred celebrities into the mix. “We’ve asked comedians, musicians, actors and artists – who have a connection to Michigan – to donate their used tank tops or A-shirts to our cause,” said Newsom. “Each celebrity a-shirt will be crafted into a reusable tote bag. A custom AShirtBag tag will come autographed by the celebrity donor then attached to the bag.” Newsom has secured participation from such stars as Kid Rock, Sandra Bernhard, Mayer Hawthorne, Paradime, The Dirty Americans, Dita Von Teese and many more. The donated shirts have been sewn into AShirtBag’s, and will be showcased at Pluto in Birmingham (400 Hamilton Row) on Earth Day, Thursday, April 22nd. The public is encouraged to stop by and preview the bags from 6:00 to 8:00 p.m. Each celebrity-donated bag will be available for bidding at http://myworld.ebay.com/ashirtbag on April 23rd. 100% of the proceeds raised from the sale of the celebrity bags will support AShirtBag’s mission, to promote science and ecology programs in Detroit Public Schools, a district with some of the lowest standardized science test scores in the country. The non-profit provides a free project-based learning program, titled “7 Things You Can Do in 7 Days to Save Our Environment,” to third, fourth and fifth grade students in Detroit elementary schools. Children receive a tri-fold handout; an eco-friendly pencil; a Tree in a Box kit and each classroom receives a set of four recycling bags. These tools are intended to motivate the younger generations to practice earth-friendly lifestyles as well as develop an interest in science. AShirtBag also provides yearly recycling services for select schools in The Detroit Public Schools and its surrounding communities. 100 Gift bags for attendees of the event will be filled with goodies from Randy’s Granola; FIGO Salon; products from TIGI’s Love, Peace & the Planet Eco-friendly hair care line; discount cards from Royal Oak’s Scout boutique, cookies by Pure Food 2U and a free yoga lesson and raw food consultation by Dawn Whitehorn of Dawn In the Raw. For more information contact AShirtBag, at (800) 915-9384 or visit www.ashirtbag.org. A-ShirtBag is located at 1331 Holden Street in Detroit. View AShirtBag’s blog at www.ashirtbag.blogspot.com.